This is a very hard post to write. I've had many bullet points listed that I want to address. I don't want to completely harp on Disneyland and how this new accommodation pass just plain doesn't work with out offering a solution to the problem. I know that it is not my job to offer suggestions on better ideas, but if this is a problem that affects my child I feel I at least should put what I think out there. You can get the new GAC or Guest Assistance Card at Main Street or guest relations at either of the parks. It doesn't take much to explain our issues. My child is sitting in a wheelchair. Not a rented wheelchair, a super heavy duty wheelchair customized to her specifications. It's not fun to travel with this monstrous wheelchair but it's a part of her so it goes where we go. Even when we travel 4,000 miles across the country it comes with us. 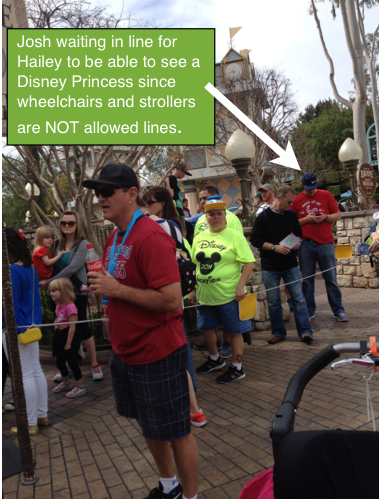 The other side of why we need accommodations are things about Hailey that you may not be able to see. She's tube fed and if it's hot outside we'd go back to the hotel to do her feeds that take an hour or more. She takes medications throughout the day. Even though she's not bashful about showing everyone her "tubie" I'd rather go to the first aid station to administer her medications via G-tube and not have to do it while standing in line with people all around who might feel uncomfortable with me doing this. Hailey wears diapers and there are only a handful of companion restrooms that I could use to do a diaper change. The bathrooms aren't accommodating for a 5 year old 57 pound child that is diapered. The diaper "area" is more fitting for a child up to about 2 years of age. Because of this issue, I can't change her on my own. Josh will hold the pull down flat table while I do the changing. I know Hailey exceeds the weight limit on those things so I try to find the bathrooms that have the tables build of concrete that she barely fits in but is more sturdy. I still need Josh to lift Hailey out of the wheelchair and up on to the table. I know there is one of these restrooms near Autotopia and one in Toon Town. Hailey gets overstimulated very easily and doesn't make staying in a line very easy. I wanted them to explain to me how this new GAC works. Hailey gets her picture taken and they ask you how long your stay will be. They make a card with the picture and her name on it and how many people are in our party. It's similar to a folded card with blank lines on the inside. In each park there are 4 kiosks. You tell the Cast Member which ride you would like to go on. They look up the wait time subtract 10 minutes and write down a time for you to return to that ride. Example: Luigi's Flying Tires has a 40 minute wait and it's 1:00pm. They will fill out that you need to go back to the ride at or after 1:30pm. You need to wait until that time to go to the ride where the other cast member will cross off the time let you on the ride and you will then need to go back to any of the kiosks and pick your next ride. You can not have multiple times written on your card. You have to do this for every ride you go on. If your child is like mine and can only do a handful of rides you are stuck going back and repeating this experience for the same ride many times over. You can not use this card to meet the characters and I was also told in lines such as the one to meet the newest princesses from Frozen, wheelchairs are NOT allowed in the line. The cast members told me I must have someone (either me or Josh) wait in the line even if the wait time is 120 minutes or longer. There are a couple reasons this doesn't work for us. 1) How are wheelchairs not allowed in the lines? 2) If I need to change Hailey's diaper and I need Josh and we have to walk over to Tomorrowland or Toon Town from Fantasyland we'd either loose our place in line or irritate the other people waiting while we get out of line and come back 1/2 hour to 45 minutes later. Same goes for medications. 2) What if we run into a tube feeding time? I'm not going to bring our whole set up for her feeds to the park and hook her up for all to see and have her be stared at. Meeting these characters is a really special thing for Hailey to do and I don't want to take that away from her because she's in a wheelchair and can't stand in line. There are multiple Mickey's, Goofy's, and Donald's. Why aren't there multiple princesses like these ones that are so sot after? There is a way to cut down on that horrendous line! How hard is it to add more Princesses???!!! I understand that people without disabilities where abusing the system. I don't think that CHILDREN with real disabilities should be punished for this. This new system has a lot of BUGS that need to be worked out and I know that they are brainstorming on new ways to use this GAC card. The way it is set up now is an even EASIER way for those awful people to cheat the system. You hear people with the new GAC cards say, "Screw going to the kiosk, write your own time in." You have a big group of people who get multiple GAC's and they all get different times for different rides and they all take turns getting later times. While getting a time to be able for Hailey to go on the Storybook ride I go up to the cast member at the kiosk and ask for a time. He said that the wait for that ride is only 1/2 hour that I should ask for a time for Splash Mountain or Star Tours that have wait times of over an hour. I tell him I'm not here to ride the rides for me, I'm here for my daughter and she wants the storybook ride. I think he thought I wasn't taken advantage of the pass. Another issue we had was at the kiosk when a cast member gave us a time for a ride and wrote the time in blue ink. When we go and redeem the time we are scolded because times are only written in BLACK ink and any other ink it's considered fraudulent and that time gets voided and you must get another time. That was NOT our fault! The Disneyland EMPLOYEE did it. When I went back to have a word with that cast member she was gone. I did find her the next day and tell her the grief and annoyance her mistake caused us and I also told guest services how appalled I was that I was accused of writing in my own time. To make up for THEIR mistake they gave me a pass that let us go on any ride we wanted with NO wait. Like I said before in my first post about going to Disneyland, there are only a handful of rides Hailey is able to go on and that she likes. Maybe Disneyland can take this into consideration and have kids with certain disabilities pick 5 or 10 favorite rides and have us have passes that we don't have to wait for 1/2 hour to 45 minutes in-between to go on. Hailey would be perfectly happy going on the Little Mermaid ride 10 times instead of the 3 times we were able to because of the wait times in-between going to the kiosks. If they did this in conjunction with the GAC pass that might be an idea! I know that the American Disabilites Act doesn't allow for any kind of proof of disability so if you say you have a disability they take your word for it. One more thing that we experienced was when we went to see the Aladdin Musical. Strollers are NOT allowed. Wheelchairs are. A lady had her child sleeping in his stroller and she wanted to take the stroller into the show. The cast member told her strollers aren't allowed. The woman said that she could not carry her child into the show and she wanted him to remain asleep so she asked again to take the stroller into the show. Again she was told strollers aren't allowed and the women said that if wheelchairs are allowed strollers should be as well. The cast member asked if the stroller is a wheelchair? If it is that is fine but you need to get a special tag from guest services." The women said no, that the child is asleep and she can not carry him as he is too heavy for her to lift. I could not help myself from saying that, "sleeping is not a disability." This woman started FUMING! She asked for the cast members name and said that she wants to speak to a manager. The cast member told her name and even how to spell it. I mean, you don't even have to be a parent of a child with a physical disability to know that conversation should not have even taken place. With this new system in place a person in a wheelchair can NOT enter through the wheelchair entrance without first getting a return time. Isn't the purpose of the wheelchair entrance is so a person in a wheelchair may enter through there? That is how it was previously and it seemed to have worked pretty well. Now, not at ALL!? It's very frustrating. There were the cast members that went above and beyond to make sure that we at least felt like we were being heard with our questions and concerns. We saved up ALL year long to be able to take Hailey on a short vacation to celebrate such a special occasion to us as her Make a Wish Anniversary, to be able to continue to create these precious memories with our terminally ill daughter. Some of the memories I have from this trip I don't want. We did our best to make the most out of this trip with our daughter. At the end of the trip we simply ended up leaving early and spending time talking with other families and taking Hailey to watch movies in the concierge area. I don't think I could pay Josh to do this all over again. The people at Disney just need to put their heads together and get this taken care of immediately. If they need help from the people that this effects then ASK FOR INPUT. I'm more then happy to help lend my insight and opinion on these matters. I imagine all the hoops I have to jump through to prove Hailey has a disability even though it's completely obvious when I apply for different services. I have to supply doctors reports, proof of prescriptions, I argue with insurance companies. I wouldn't claim my daughter was disabled if she was NOT. I have to live this nightmare fighting for my daughter EVERYDAY. I shouldn't have to fight for her to go on a couple of rides at the "Happiest Place on Earth..."